No thanks to that either Mr. Disturbed Person. Why don’t you &^%$ a cow and then after that, *&^% a ^$#@ while you’re *&^%? Seek help random Internet troll. It used to bother me a bit, but now I feel sorry for the senders. They aren’t well adjusted and have probably suffered mental trauma. So, when nastiness arrives in my inbox or comments, I hit the Delete button and hope that the sender can recover from whatever happened to them and become a better person. In a small way, these perverted invitations from people living in their mother’s basements are a sign of success. When I receive hate mail, I smile just a little, knowing that my blog has reached a wide audience, even the crazies. While I wouldn’t classify the comment as hate mail, this guy is clearly a jerk who had nothing constructive to add to the conversation. He was probably picked last in gym class and called rude names by childhood tormentors. Poor guy. When I saw the comment, I considered deleting it. The guy added no value to the conversation, but perhaps he was slightly correct in calling out a flawed investing strategy. While I would never advise anyone to own individual stocks, there is a lesson in here for everyone. The stock market is cyclical. Over the long term, it goes up, but in between there will be down times too. Don’t freak out and sell; stick to your guns. Don’t point your guns at Internet trolls either). After the dark, there will be dawn that will brighter than any previous one. Holding on to Apple this whole time was a wise decision. I am more financially successful than I ever imagined I would be and Apple is a big reason why. I bought most of my shares in January of 2007 for about $13 (accounting for the 7 for 1 split). I’ve only sold shares very recently because Apple represents too much of my portfolio (rebalancing). How is your portfolio doing? I generally love when people think they know so much that they are rude and nasty, but then time shows their ignorance. How do you like my Apple now?? Oh wow, now I’ve sunk to his level. I promise not to do that again. Couldn’t help myself this time though. Mr. Snark, I really do hope that life is treating you better. Be a better person and the world will reciprocate. Addendum: My buddy Steven over at Even Steven Money published a post about the same topic yesterday. In no way did we plan this. The Universe works in strange ways on some days. He could have made a valid point about the dangers of holding individual stocks or any number of other constructive criticism and you would be fine with that. Adding to the debate as you say. But he ended up just coming across as a total D-bag. Exactly! Owning individual stocks is a bad, bad idea. And I do it myself. Point the snark finger at that Mr. Basement Dweller. Yep, it is people who are disturbed or their lives are out of control. 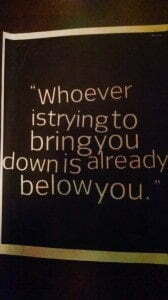 They seek gratification by bringing others down instead of bringing themselves up. I second the jerk statement. S/he is an asshat plain and simple. I still don’t know why people feel the need on various internet sites to be such jerks or not believe that people who save, are informed and invest well, etc could retire early, have a better life, etc. It is like they want us to be miserable. And the anonymity of the internet only increases the jerkishness (we should make that a word) of people. Keep doing what you are doing. While I don’t own Apple individually it is certainly part of several of my mutual funds investment and responsible for me getting a 40% return on my money over the past two years. Woo hoo. Besides, this guy has no understanding of stocks, one of the best run companies in the world, with little to no debt. Um, a good choice if you ask me. Thanks Jason! I’m sure it is a “he.” I’d suspect that 99.9% of them are. Thanks! I’m glad someone got that line! I get a lot of hate mail. It is normal to receive hate mail, when you are successful at something. 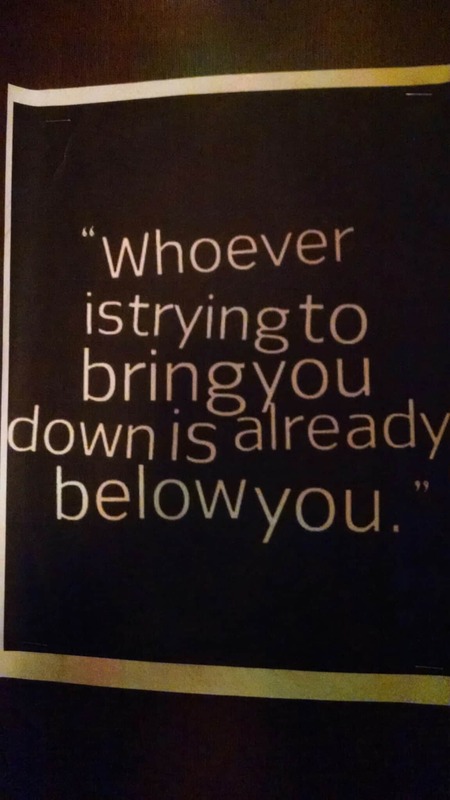 There is a portion of the population who will resent you for being better than them, and try to put you down. I’m glad that I’m not alone DGI! That is an awesome quote and for some reason, I thought it was one of Munger’s? Munger says it in his “Poor Charlie’s Almanac”. I think he is quoting George Bernard Shaw though. Damn DGI, quoting Munger too. I think he’s more brilliant than Buffett. Are you going to FinCon? Where in the world are you? I’d love to sit down and chat someday. Let me know the next time somebody throws a stock in your face like that. Sounds like a contrarian indicator to back up the truck. Internet tough guys, there everywhere. I doubt he’ll comment now. Brian @DebtDiscipline recently posted…Freelancing the way of the future? Yep, no responses from Mr. Snarkypants. I sometimes engage with some of those comments in a very non-defensive way. Sometimes I just let the comment through and my readers come to my defense. And then sometimes I just delete the comment, depends what kind of mood I am in. It was actually really funny. It is the exact way he manages this on Financial Samurai. It seems like their insults bounce off you like you have troll armor. Nice! I WISH I had trolls! It’s a sign you’ve really arrived. If you don’t have trolls on your blog, you might as well not even exist on the internet. Hmmm, maybe I’ll start trolling you. What is your address (I want to start with one of those garden trolls). Yep, apparently some of em’ take breaks from looking at dirty websites, eating Cheetos* and playing video games. *Sorry Cheetos, I still love you. As someone else who is overweight in Apple, I can understand how people were trashing this incredibly profitable company for no reason. 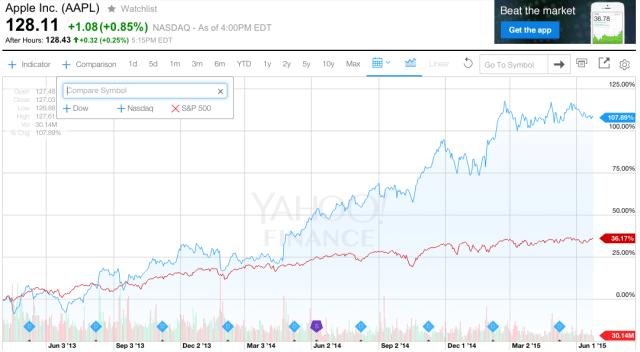 Sometimes the market is irrational, and Apple’s decrease before the split was a great example. I have yet to receive any hate mail. I am actually looking forward to it for the reasons you mentioned. Yeah, that Apple dive was a huge buying opportunity. They are so incredibly strong now. I’m shocked at just how well the iPhone 6 continues to sell this late in the cycle. Is it terrible to think this guy is probably buying Apple stock at today’s prices, and calling other people idiots for staying on the sidelines? Did we just have an internet blogging moment and wrote about the same thing without talking about it. Ha ha, we’re telepathically connected apparently. Quick: What animal am I thinking of?! In order: zebra, honey badger, cow. I bet you’d like a bite of my Apple now! I just love Karma, especially when it gives some of the good stuff to the people who deserve it (sometimes in the form of appreciating Apple stock? ), and hopefully a little bad stuff to those jerks who wander around the internet asking for it. Jason recently posted…2015 Income Increase Initiatives – half-time check-in! Ha ha! I don’t wish ill will on many, but it sure feels good when you turn out to be right and they turn out to be massively wrong. Coming from a tech background I didn’t have enough disposable cash at the time to catch the GOOG train. I did catch AAPL though. My taxable account strat is about 80% DGI safe style. If not that index style would be runner up like my 401k. But i really enjoy the 20% for growth stock game playing. I almost pulled the trigger on FB but talked myself out of it because the whole “social online revolution” i just never got. They have proven me wrong time and again (can’t win them all). What’s REALLY annoying is that i wanted to invest in Oculus soooo bad but you have to be licensed/have-alot-of-money to do that style of early investing. The second i saw John Carmack show basement-style-duct-tape-pre-alpha-negative-version-0.5 tech i knew there was something special. And later f’ing FB f’ing shells out 2 billion for them. Grumble. Individual tech plays require a large set of cajones though. Facebook is a big risk. While it is more robust than MySpace, some day, someone will take it down. I think old boy Zuck is pretty smart though. Oculus Rift was one example. He’s looking 10 years down the road. I quite like the fact that he is will to take huge bets like that. Speaking of huge bets, Apple Car anyone? Carmack is a genius! As soon as I heard he was involved, my excitement level went up about 10 notches. Totally. I dancing with rattlesnakes. Let haters never get the best of you because they only come in when you are closest to your biggest dream. The best thing is to keep on moving. Anyway, it’s more frustrating if you are going to listen to whatever silly things they have to say.